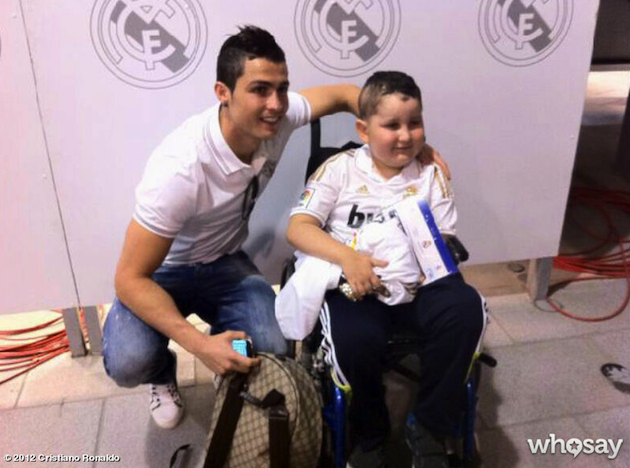 Nuhazet, a 9-year-old boy from Las Palmas, Spain, has been battling cancer since before his second birthday. When he met Cristiano Ronaldo before Real Madrid's final match of the season last month, it was supposed to be the fulfillment of a final wish for a young boy who had already endured a lifetime of suffering, but it turned into the start of a renewed fight backed by Ronaldo and his agent, Jorge Mendes. A story on Canarias Investiga reports that in March, an MRI revealed that Nuhazet's cancer had spread to three different parts of his spine. Doctors told the boy's parents that there was nothing they could do and recommended they stop treatment so Nuhazet wouldn't suffer any more than was necessary. His parents asked if there was anything anywhere in the world that could be done to help Nuhazet, but they were told that the only treatment options left were experimental. So to fulfill one of Nuhazet's dreams, his cousin enlisted the help of some influential friends and got the attention of Jorge Mendes, one of the most powerful agents in football. They arranged a trip from the family's home in the Canary Islands to Madrid for Real Madrid's final match of the season against Mallorca. The day of the game, Mendes and the family surprised Nuhazet with a special meeting with Ronaldo, who made a few jokes, took some pictures and promised the boy that if he scored a goal that day, he would dedicate it to him. After the meeting, Nuhazet went to watch the match from Ronaldo's private box with his family and Cristiano's swimsuit model girlfriend, Irina Shayk. Real Madrid beat Mallorca 4-1 and lifted the Liga trophy for the first time in four years. Ronaldo scored the first goal of the game and dedicated it to Nuhazet. As perfect as the day was, that was supposed to be all there was to it. But the following day, Mendes had Real Madrid president Florentino Perez, who weeks later lost his wife to a long fight against lung cancer, personally call doctors at Sanchinarro Hospital. They quickly saw Nuhazet and started a new course of treatment that included a personalized drug from the United States with Ronaldo and Mendes paying for everything. This story is reminiscent of reports that Lionel Messi decided to pay for the medical costs of 12-year-old Waleed Kashash, who suffers from growth hormone deficiency (which Messi also had as a child), until Waleed turns 18. Those reports were later found to be untrue, but Messi was already widely seen as a kind and generous person. For an idolized and reviled athlete with a reputation for being selfish, vain and egotistical like Cristiano Ronaldo -- himself the father of a 2-year-old son -- it's important to remember that the parts of life on public display are rarely enough to provide the complete image of an actual human being. You can call this a PR stunt and debate whether it makes Ronaldo more likable, but the important thing is that Nuhazet is still undergoing treatment and could return home in a few weeks as he awaits his custom medication. And it all started with a trip to a football match.